I've claimed these great spicy nuts as my own. They make a great holiday treat for the guys(and ladies) at the office. My family likes to turn the heat up on their food, and these really hit the spot. Real good! -- as advertised. Your hot peanuts are addictive. Great product. We would have ordered the 25lb bag but the shipping cost deterred us. I understand you have to cover costs though. Very flavorful, great quality, and a bargain for the amount of nuts you get. Perfect amount of spice! I get an order of the spicy flavored peanuts every year. Someone at the office refers to them as "Andy's Spicy Nuts!" Call them whatever you want, they are delicious!! These are simply some of the best peanuts I have had. I love salted in the shell peanuts, but the local stores no longer sell them (?) health craze, I dunno. I found this site, and ordered some. I saw the hot peanuts, ordered them as well. Both are gone, and I have ordered 3 more bags! LOVE LOVE LOVE these, and prompt shipping to my door - all is good here. Good flavor, but kind of stale and soft. Not as fresh and crisp as the similar "Hot Nuts" from Hampton Farms. Owner Response:We're sorry to hear about your problems with that order. We'll be in touch regarding our 100% satisfaction guarantee. I received my box of peanuts on Friday afternoon. I opened the box and tried the nuts. They were neither Hot nor Spicy. I called and left a message since you were closed for the weekend. I got a call back from Alice on Monday morning. She was very sorry for the mix up and said she would ship me another box of Hot & Spicy at no charge. I thanked her for the quick and generous reply. I sent the Roasted in shell and Ghost pepper to my peanut lover son in Calif. He said the roasted tasted a bit stale and Ghost wasn't that hot. Sort of a waste I guess. These peanuts are delicious! My work partner got a couple of bags of these for Christmas and brought them in to share with us. After the first bag was gone, I went ahead and ordered the 6 lb bag! We are hooked on these peanuts. They are hot, but not overly seasoned. I would definitely wash my hands before rubbing my eyes though. Great flavor, took them to work and those bad boys were gone, going to order more!! First time purchasing peanuts online, I am very pleased with my purchase and will buy again. The peanuts were fabulous! Perfectly roasted and just the right amount of salt. Shipping was super fast. Wish we had ordered more. Will definitely be placing another order soon. I have been looking for in the Shell hot penuts ever since texoma penut inn went under. These are really good. Not to hot, but after a few you can start to feel the heat. Great for on the lake or around a fire with your beverage of choice. I will be a returning customer. Could not give 5 as it seems that the peanuts might be not the good ones some were small, some shells no peanuts etc. I discovered these in a little shop in Newburyport MA. I'm SO GLAD I tried them! This is the best gift ever. They are addictive, delicious and since trying them - I've sent orders all over the USA for my foodie friends/birthday gifts and just a plain treat. Wasabi peanuts got raves as well! I love Bertie County. Thank you for producing such a delicious high quality product. If I could hug you I would! I will give them a four star rating. Shipping was fast, taste great, but need more salt. I've tried other brands which were over cooked, dry or just not good. 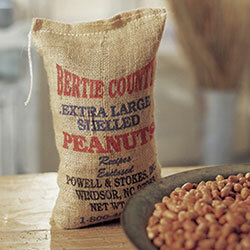 I've never had a problem with Bertie Co. peanuts. They're always good. 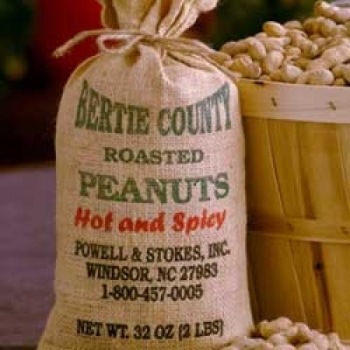 I know I can count on quality peanuts from Bertie County Peanuts. The roasted in the shell - Hot - peanuts are a favorite in my house. It seems that some batches are hotter than others and for me.... the hotter the better. Either way I love em". 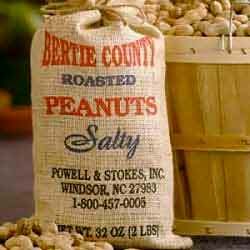 Thank you Bertie County Peanuts. Love the bag they come in. These are a great gift. I bought them for a gift but ended up giving them to myself. Very good hot nuts & well prepared. Will reorder again, thanks! I sent 8x2-lb. bags of hot-n-salty roasted puts to a Vietnam buddy. He said "spicy!," his wife said he ate enough to fill an elephant. I will order some for myself, based on their positive reviews! The spicy peanuts were incredible! I introduced them to many friends and they loved them as well. They are a little expensive with the shipping, which will limit me from buying them more frequently. Your peanuts are very well liked in this area, a shame they aren't more well known. A faster, easier, more cost effective way to distribute them would really help. Thanks! I wanted hot spicy peanuts in the shell. To me, the nut were at best luke warm. Great flavor but not hot enough. All of my family and coworkers look forward to Andy's Spicy Nuts this time of the year. They are great as a holiday snack. I really can't tell you what they taste like, but the fragrance is making my mouth water!! I purchased 2 bags, one for my husband and one for my grown son fill their Christmas stockings. The packaging is in burlap which is cute! The quality of the nuts was amazing. The heat wasn't quite up to our expecations but still good. They were good but just on the small size. Peanuts are good and we have saved several for gifts. 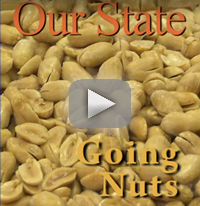 WE purchased the spicy peanuts to give to family for Christmas and we received rave reviews! The spicy peanuts are not too hot,just right. I think they are mildly addictive,since I seem to have to eat some every day, and panic when I'm about to run out of them.